Clean and cut sardines into pieces and keep it aside. Soak kudampuli in 1/2 cup water. 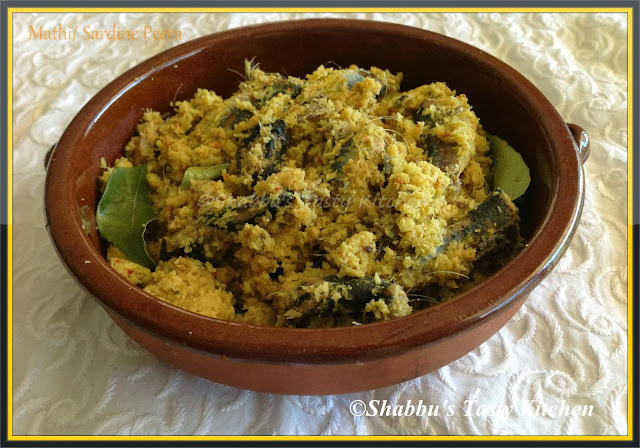 Crush grated coconut, turmeric powder, dry red chillies, sliced shallots, garlic cloves, green chillies and curry leaves. Transfer the crushed mixture into a manchatti or pan and mix well (using hand). Then add cleaned sardines, soaked kudampuli with its water, salt and little water and mix well. Cover and cook in medium heat for few minutes. When it boils, remove the lid and mix it well. Then add coconut oil and few curry leaves. Its a beautiful dish and I love anything with the fragrant of curry leaves, what more with fish.